A little more than a week ago, Finn's obsession with sinking ships waned, but of course, a new passion immediately followed. 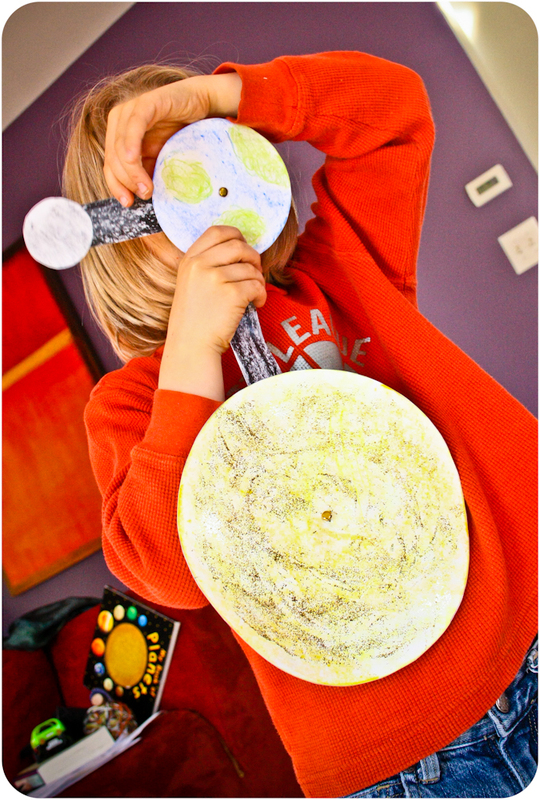 I can't say that I know exactly what sparked this particular fascination, but he has been reading his few planet and solar system books regularly for a few months now. I scoured Pinterest and found a few projects that I thought might capture his attention over the 4-day weekend he had at home. The first project that we tried came from a lesson plan site and didn't have any instruction so we made it our own. 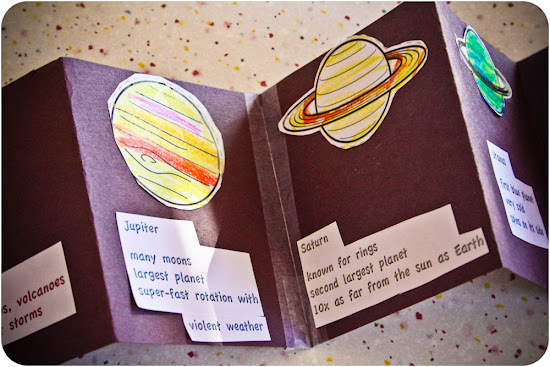 I found a cut-out template of the planets, which Finn colored and cut out, then we cut sheets of black construction paper in half and taped them together length-wise and folded our book accordion-style into a flip book. Based on his reading, Finn came up with 3 facts for each of his planets, which I typed and he taped onto his flip book. 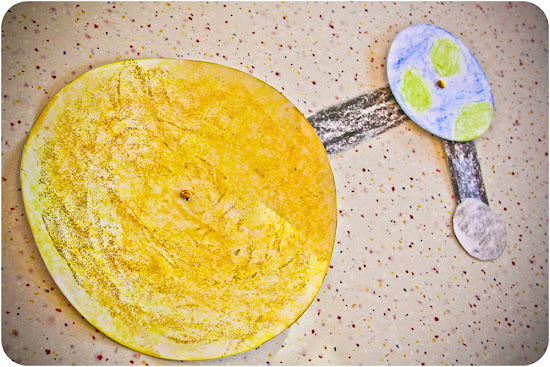 This was probably his favorite of all of the solar system projects we made. 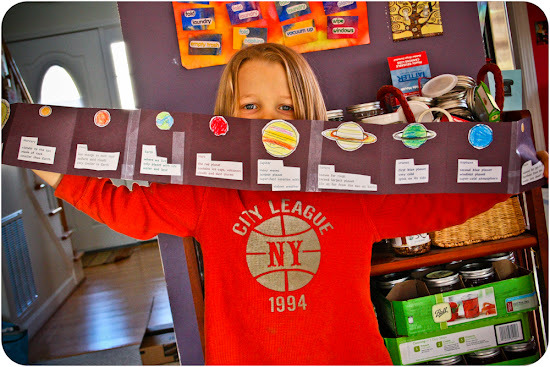 I also found this project on Pinterest, and knowing how Finn loves any project with brads, I just gave him 3 different sized bowls to trace and a thick piece of paper and he really did the rest. 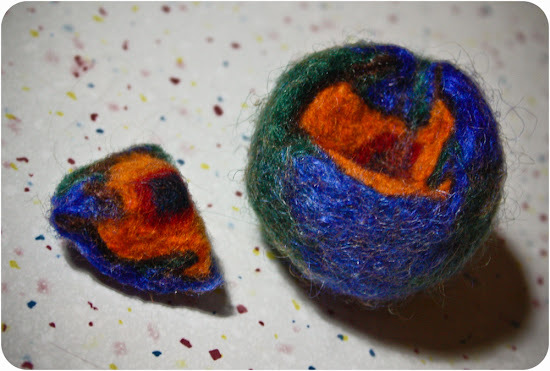 While he slept one evening, I decided to make a felted Earth, based on this model in Rhythm of the Home, only I decided to wet felt the Earth after a small amount of needle felting. 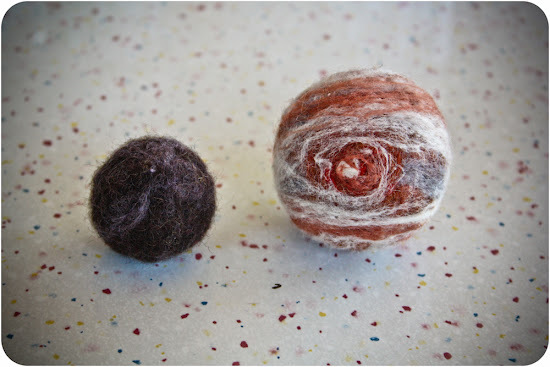 The Earth felted firmly, but the inside layers lost some of their shape in the process. Finn can still identify the crust, mantle, outer core, and inner core. After spending some time with his felted Earth, Finn requested that I make him a felted Jupiter, complete with Red Spot, and make Paulie a felted Mercury. Both of these I needle-felted, and we have yet to cut them open to see if the layers remained intact. 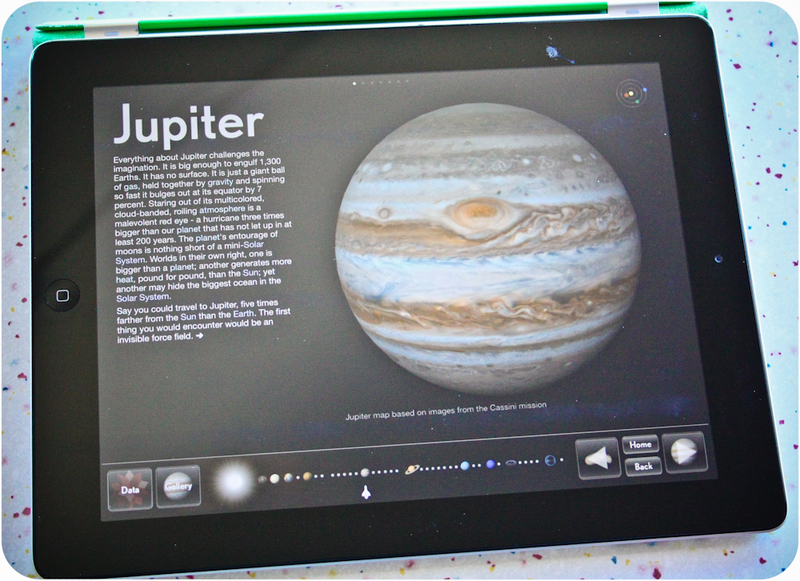 Finn has also immensely enjoyed spending a bit of time, in addition to his reading his planet books, on 2 different solar system iPad apps. One, geared for elementary age children, is called Montessori Solar System and the other, pictured below, is just named Solar System. 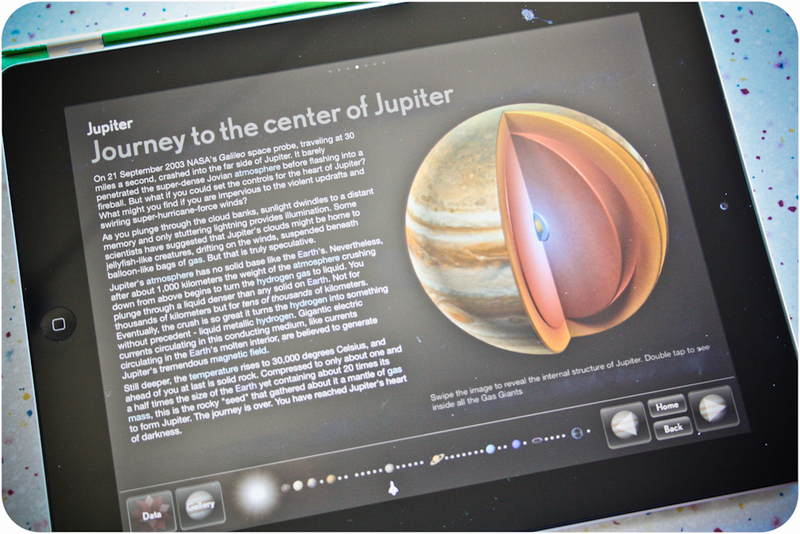 This Solar System app is just amazing and so comprehensive and interactive. It includes every named moon and dwarf planet with information about each. I'm not inclined toward purchasing many apps or letting my children spend much time on electronic devices, but both of these are solid, not over-stimulating, and very informative, almost like researching online with a bit more interaction. 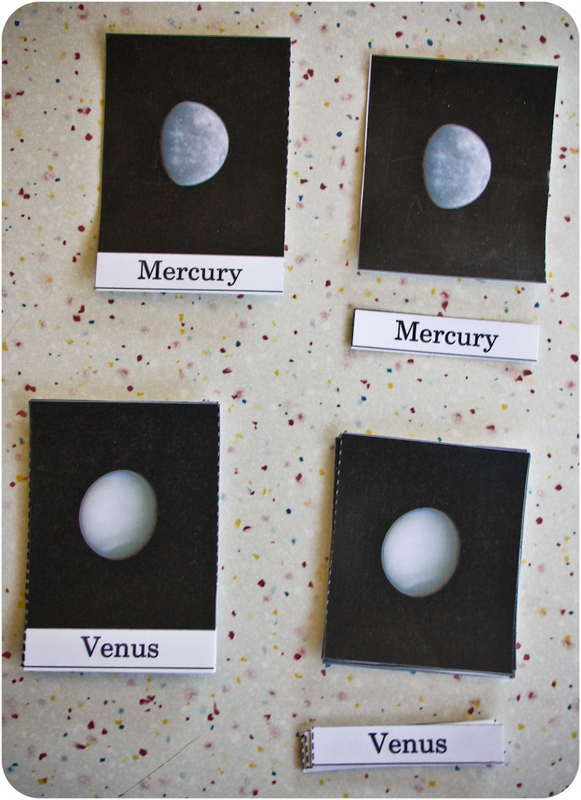 I found a set of free Montessori card printables, which we made into 3-part cards. Finn tends to get tired of the 3-part matching relatively quickly, but he will endlessly play with the cards with the names attached, comparing the planets in various books and on these cards. He has great attention to detail! Elizabeth also helped Finn find a placemat that one of the older kids used years ago and which now happily sits at his mealtime spot. 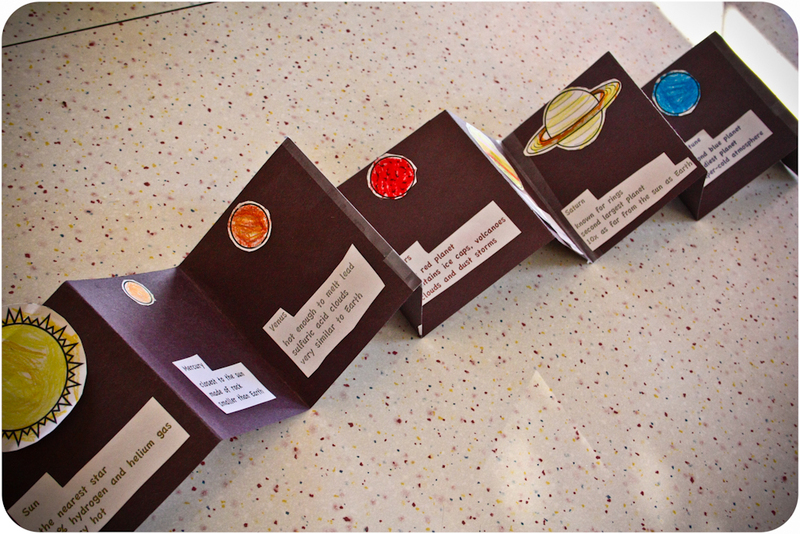 And that is about the entent of our solar system unit so far. He is disinterested in branching out into stars and constellation. He adamantly wants to include Pluto in any project or discussion, to the extent of spewing vitriolic contempt at the scientists that reclassified Pluto as a dwarf planet. And he's still voraciously reading and absorbing new information about the planets. 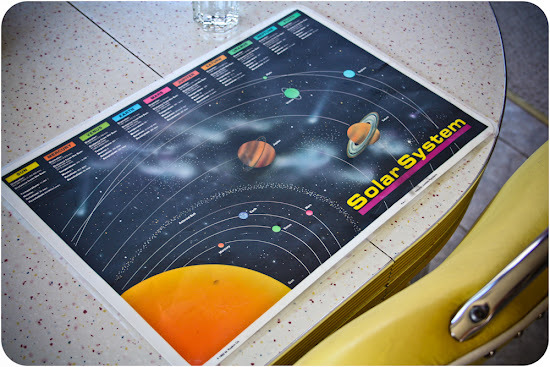 If you know of any more solar system projects dealing directly with the planets, please send them our way! The end game of all these obsessions is that Finn has passion. Passion for learning, passion for life and that's the best lesson of all! Well done mama!